Back Story: I have always had healthy, strong teeth and have had few cavities as a child or adult. After 2 pregnancies and nursing both those babes, I have noticed changes in the health and strength of my teeth. This makes sense, on some level, as the nutrients to grow a new human (and fill that new human's stores) are taken from the body of the mother. In the perfect world, where all people eat 100% whole foods, mother's bodies would be better equipped for this childbearing giving of nutrients. But that is another story and another blog post... maybe! Two years ago, in the fall of 2015, I cracked a tooth (lower right side of my mouth). Honestly, I don't remember how. I was advised to have the tooth capped with a composite crown made right in my dentist's office. I had this procedure completed. After having the crown, I was not able to chew on that side. This discomfort in my tooth and jaw remained for weeks. I was told the crown needed to be filed down. When that did not solve the problem, I was told my upper tooth, above the capped tooth, needed to be filed. "Pain upon chewing is often because the crown sits to high above the height of the original cracked tooth." I said no to filing my upper, real tooth. This did not make sense to me... filing off the enamel and minerals of a perfectly healthy tooth to accommodate a fake tooth. (This seemed like an invitation to weaken the real tooth and invite in decay.) I asked to have the fake tooth filed more and if it was getting too thin to file then replace it with a shorter version that fits better. A year and 1/2 later I was still not able to chew on the right side of my mouth. Then, in comes the serious pain: shooting pain in my lower right jaw. Ouch! Upon x-ray, I am then told the previously cracked and now capped tooth is suffering from root infection, decay, and needs to be "root canalled" to preserve (not save) this dead tooth. How did I plan to do this? It was a work in progress but I used my knowledge and training as a RN, Herbalist, and Natural Health Education Specialist to create my own plan. 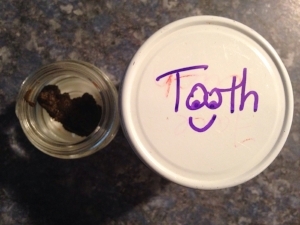 I also did essential oil applications directly to the gum line of this affected tooth. FYI: I am not big on ingesting essential oils (putting them in my mouth means they will get ingested but I am also not big on losing teeth) as they are very strong and hard on digestive tract tissues and gut microbes. Rosemary, Tea Tree, & Thieves essential oil X 1 application, these are anti-microbial and anti-inflammatory essential oils. I mixed 2-3 drops of each into about 1/4 tsp. organic olive oil and applied directly to gum line, both sides, off affected tooth area. I actually rubbed it onto the gum line on that whole side of my lower mouth. Herb Doc Oral Therapy Tonic for teeth, gums, tongue, & breath applied to gum line 2-3 times daily at opposing times of the X-Ceptic formula above. I applied this every 2-3 hours along my gum line for at least 3-4 weeks. Herbal Tooth Powder and the Complete Tissue Oil contain herbs (comfrey leaf & root) to rebuild tissue. After 3-4 weeks, I applied at bedtime and again in the AM. I did this for several months. I then swapped out to using only at bedtime and stopped putting the essential oils in it. Now, 6-7 months later, I use it 2-3 nights a week. After 2 years... I can finally chew on the right side of my mouth. Yes, even hunks of raw, hard carrots. My dentist tells me that this is only temporary... that I will, no matter what, need to have that damned root canal. My tooth is feeling pretty good these days... But, I will keep using my tooth powder paste... and take each new day and challenge as it comes to me. Honestly, this is just approximates of everything. This is how I cook and this is how I make my herbal remedies: pinch of this & pinch of that. Handful of this and handful of that... depending on what I am making, for how many, and how long it will be shelf or refrigerator stable. water, just enough after I added everything else to make a thick paste that would spread onto my gum lines and not melt away quickly, generally it is still there, on my gums, in the AM. I just rinse and spit upon arising. Trust me, you will want to. The taste in your morning mouth needs resetting! I keep this in a small glass jar in the refrigerator. I keep enough for a few nights in another small jar on my bed side stand. When my bedside jar is empty, I wash it with hot soapy water, and put more in. They may not be perfect... but they are mine, well, mostly mine! My infection is gone. The only time I notice a flair is when I eat sugar, which is very rare. Holidays caught me on a couple of occasions and I would notice, within a few hours, pain under that problem tooth area. Huge wake up of the damage sugar does in the body and how sugar flairs infection by feeding the microbes and weakening the immune system. Recently, I also used CBD ointment, mixed in with the comfrey tooth powder herb mash, for a while. Anti-inflammatory & anti-microbial. The below image is from a FB self healing group. The teeth are a mirror image of yours. Top is top teeth, bottom is bottom teeth. Right side of picture = left side of teeth / mouth. Left side of picture = right side of teeth / mouth. Although, the sides of mouth & the impact on whole body health are same on both sides. 2nd image is another version from a natural healing doctor.